The mission of the Dr James Still Historic Site and Education Center is to preserve and interpret the legacy of Dr. James Still, known as the "Black Doctor of the Pines," and the town he called home. The site was the first African-American site purchased by the State of NJ for historic preservation and was leased to the Medford Historical Society in 2013. 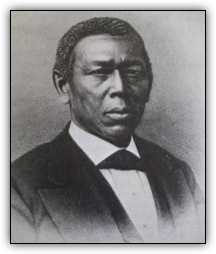 Dr. James Still (1812-1885), a renowned herbalist and homeopathic healer, was born at Indian Mills and resided in Burlington County most of his life. He was one of 18 children born to former slaves Levin and Charity Still and his brothers included famed abolitionist William Still and Peter Still, who rescued himself from slavery. Born into poverty and mostly self-educated, James Still became one of the wealthiest men in Burlington County and owned land along Church Road in Medford from Cross Roads, the intersection of Church and Mt. Holly Roads, to Wilkins Station. He built a fine house with a small office next door and developed a hospital in an old tavern on Route 541. He married twice and had eight children. James Still’s story was one of hard work, thrift and saving. He prospered through his own industry and gave much of the credit to Providence. He and his family experienced poverty and prejudice, but persevered with faith, modesty and frugality. Dr. Still recorded the story of his life and philosophy in an autobiography, Early Recollections and Life of Dr. James Still, published in 1877. Dr. Still rebuilt and enlarged his home three times until it was a substantial, mansard-roofed edifice. Unfortunately, it was torn down in 1937. His medical office remains, however, and has been used as a residence throughout the years. New Jersey purchased the Still office and grounds in 2005. Dr. Still’s property is the first African-American historical property acquired for preservation and interpretation by the state. New Jersey also bought the Bunning Farm located immediately to the east of the Still property, envisioning it as a buffer and interpretive site. In June 2013, Medford Historical Society signed a Special Use Permit with the State of New Jersey to allow the repurposing of the Bunning Farm at 211 Church Road into an educational center that would preserve and teach the legacy of Dr. James Still. The Historical Society rallied an army of volunteers to clear the properties and reclaim the farmhouse, transforming it into an educational and cultural center that tells the Still Family Story through workshops, displays, and seminars. The surrounding grounds will hold a historic herb garden in tribute to Dr. Still’s work. The state of New Jersey intended to restore Dr. Still’s Medical Office to its original state. However, the Superstorm Sandy recovery used all the available funds, so that project has been postponed. We eagerly await its completion. The public is welcome to the Center during special events. Youth groups and adult organizations may schedule visits for a program and tour by calling 609-975-8794.